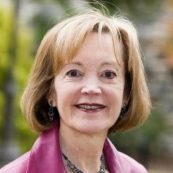 Sherry Lee Mueller, Ph.D. developed and taught the first course in public diplomacy at the School of International Service at American University in 1981 and returned in 2012 as Distinguished Practitioner in Residence to pioneer a course as well as a practicum in cultural diplomacy and international exchange. Her professional career included a variety of leadership role such as serving as Director, Professional Exchange Programs, at the Institute of International Education and President (for 15 years) of the National Council for International Visitors–now Global Ties US. The Board named Sherry President Emeritus in 2011. She has served as a State Department speaker on NGO leadership in Saudi Arabia and Japan. In 2014 Georgetown University Press published the second edition of Working World Careers in International Education, Exchange and Development that she co-authored with fellow SIS grad, Mark Overmann. In addition to her expertise on international careers, her work including presentations, publications, and board service have focused on the evaluation of exchange programs, citizen diplomacy, and advocacy. Sherry earned her BA at the School of International Service at American University. She completed her grad work including her Ph.D. at the Fletcher School of Law and Diplomacy, Tufts University. She is a native of northern Illinois.